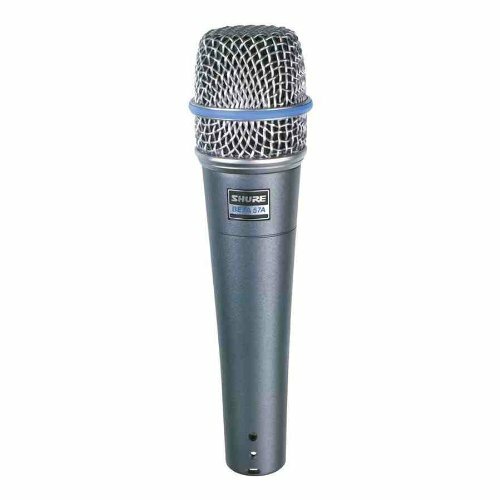 The Shure Beta 57A Dynamic Microphone is a precision-engineered dynamic microphone designed for professional live sound reinforcement and studio recording. A tight supercardioid pattern on the Beta 57A delivers high gain before feedback and maximum isolation from other sound sources, with minimum off-axis tone coloration. Shure Beta 57A Dynamic Microphone Features: Tailored frequency response provides drums, guitars, vocals, and horns with studio quality sound, Uniform supercardioid pattern for high gain-before-feedback and superior rejection of off-axis sound, Hardened steel mesh grille that facilitates use of proximity effect and resists wear and abuse, Neodymium magnet for high signal-to-noise ratio output, Advanced pneumatic shock mount system that minimizes transmission of mechanical noise and vibration, Frequency response: 50 to 16,000 Hz. Shure Beta 57A Suggested Applications: Guitar Amp, Bass Amp, Acoustic Guitar, Brass and Saxophone, Snare Drums, Rack and Floor Toms, Congas, Woodwinds, and Lead Vocals. Tailored frequency response provides drums, guitars, vocals, and horns with studio quality sound.